School holidays is here again. Yea yea yea....don't be jealous. We have so many holidays here in Malaysia. So where are you heading to this school holiday? North? South? East? West? I still remember last school holiday we went to Ipoh. Ipoh is another food haven . Cincai tembak aje, you can find good good. That was what we did. It was Christmas holiday. Those famous restaurants , especially dim sum restaurants were so crowded that there were long queue outside the restaurant. parking? Haiz....no need to think la. Not sure where to eat, we round and round the town. And spotted a parking space. Wokay...just zoom in la. Look left look right....got what to eat nearby ah? 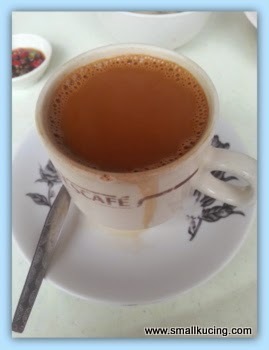 Then spotted this Kedai Kopi Woh Heng. Looks good. Quite and old shoplot and saw a numbers of hawkers stall inside. Stepped into the restaurant. Lucky for us, managed to get an empty table. Look left look right. Saw many are eating curry noodles and Kon Low mee. I want Kon Low mee la. Papa also copied me. He want the same too. 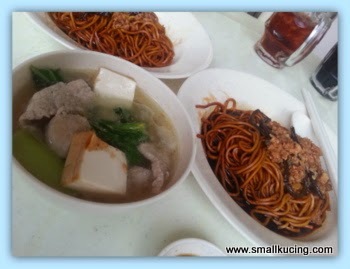 The kon Low Mee have mince meat topping and comes with a bowl of meatballs, pork, tofu and vegetable in clear soup too. Price....really gave Mamarazzi a shock. Less than RM5. Think it was around RM4 or RM4.50 only. Taste wise, I like it lah. You know I like noodles mah. Mamarazzi opt for their white coffee. Hey not bad. She ordered Curry noodle for herself. Comes with a spoon of lime juice. Yes, it taste good to add this into the noodle or into the spicy sambal. Loaded with goodies. Char Siew(BBQ pork), Taufu pok, Cockle and etc. Yummmy....and again it was less than RM5 leh. If in KL ?PJ area, the price would have been nearly double. Only one thing would make this perfect is that the Taufu Pok is cooked together with the curry instead of just blanch with hot water.But then after soaking into the curry, result is similar la. Nice. After finishing his plate of Kon Low Mee, while waiting for me to finish mine...Papa spotted a man at the next table having Wan Tan Mee with Spare rib topping. Hmm.....apalagi....order lo one plate for himself. Price....forgotten liao but it's the most expensive of what we ordered that morning....Think it was just around RM5-RM6. Very surprising. With Spare ribs wor...at that price. unbelievable. How the lady get any profit ah? Mamarazzi said next time will wanna go to this shop again to have their curry mee and to see what else is good there. I agree with the title la, delicious hawker food.. And you know what, hawker food is memang delicious punya.. I love love love it so much.. I think of ckt and curry mee jor.. And true enuff, I see mamarazzi's curry mee, wah, drooling leh.. I just back from lunch, but I no order curry mee la, coz weather very hot.. if eat curry mee, later sweat a lot leh..
morning tarak hot lah.... inside the restaurant some more hahaha. The curry noodle so cute comes with lime juice that they siap squeeze for you. It looks good and so does the kon low mee. Yes, this shop surely has delicious curry mee. Haven't been there for some time. Hmmm must remember...keep for tomorrow's breakfast. Yeah I am so jealous of course. Who likes to work and get stressed in the office? Curry and spicy noodles are my all time favourite! Lagi pedas lagi bagus! The lime juice sure added some power boost to the taste. I wish I have the fate like you guys who run around for food. Waaa!!! The curry laksa making me drool, what more with see ham. There's a coffee shop that i occasionally, they sell white coffee, i like although it's more expensive than the usual kopi.. So so cheap! I love that kon low mee with soup. Yummy. 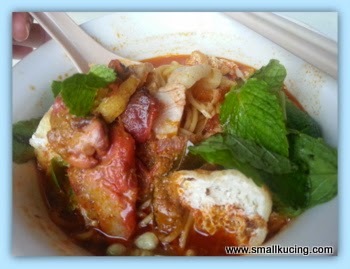 Konlou mee is Sabah's signature noodle dish along with their Tuaran mee. Can't say I like it a lot - same thing with wanton mee. 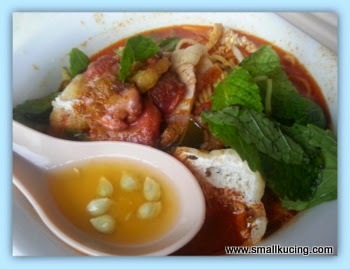 Curry mee sure looks different from those elsewhere like in Penang, for instance. No pig's blood? P.S.:Hahhhhh!!!! I spotted this in the list of labels on the right - trengganu. Come, ask your papa to see. Hehehehehehe!!!!!! Your blog is lovely ... will try some your dishes ... Love, cat. true true true.. Uncle SK also has the same thought leh, it's like in every corner of Ipoh there are good food to eat, haha!! 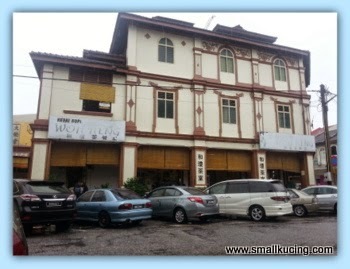 no wonder Ipoh is known as the Food Heave of Malaysia besides Penang.. where is this place in Ipoh ah?? looks like in some old area, those colonial buildings are still there looking well maintained..
the kon lo mien looks good leh, got so many liu in the soup!! not only many but also variety, and even have mince meat to go with the dry noodles, very got "sing yee".. i heard they have nice soy sauce in Ipoh, and they like to use have mushroom and mince meat, for example on their wantan mee and also chee cheong fun.. hehehe, Uncle SK got many Ipoh friends and every time when they "discuss" about KL food vs Ipoh food, Uncle SK learns a lot from them, haha!! 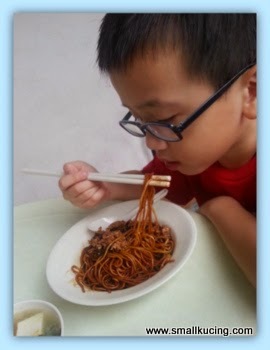 but Uncle SK likes the curry noodles more leh.. especially that spoonful of calamansi juice!! OMG, usually they will just give you half a calamansi thrown onto the noodles, and we will have to pick it up and squeeze ourselves.. but then this one was done for the customer leh, so good!! except that there are still seeds left, but Uncle SK likes the gesture leh, can just pick away the seeds and straight away mix in the juice, NICE!!! hahaha...no need to dirty the fingers is it. eih, no joke leh, can still find RM3.50 noodles and even chicken rice in Ipoh leh, Uncle SK was a little surprise.. of course those more neighbourhood kopitiams lah (those famous ones sure will be more expensive).. and when in Ipoh, Uncle SK who is not a coffee lover will also like to drink their iced white coffee, very nice and smooth leh, and if not wrong, a lot cheaper than KL lor..
We have same taste, I would hantam the kon low mee too! arrrhhhh.... i miss home and the food! so spontaneous, eat wherever got parking! Good one! Reading your blog at this hour really not a good idea. Make me hungry leh! You are making me hungry and I am in a motel in Las Vegas. Need to go find food.